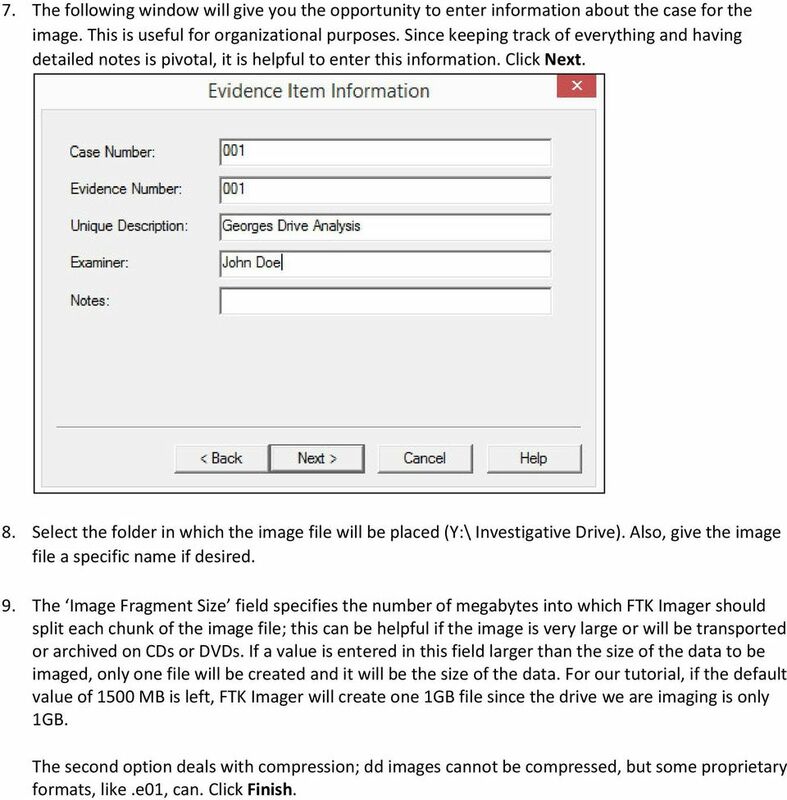 Download "Digital Forensics Tutorials Acquiring an Image with FTK Imager"
1 Digital Forensics Tutorials Acquiring an Image with FTK Imager Explanation Section Digital Forensics Definition The use of scientifically derived and proven methods toward the preservation, collection, validation, identification, analysis, interpretation, documentation and presentation of digital evidence derived from digital sources for the purpose of facilitating or furthering the reconstruction of events found to be criminal, or helping to anticipate unauthorized actions shown to be disruptive to planned operations. A large part of digital forensics is working on cases to process and analyze digital evidence collected from crime scenes. 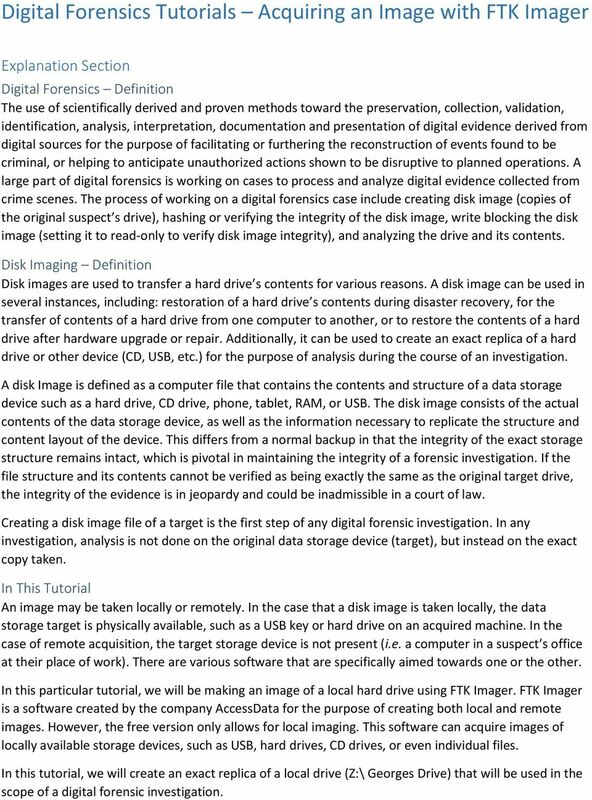 The process of working on a digital forensics case include creating disk image (copies of the original suspect s drive), hashing or verifying the integrity of the disk image, write blocking the disk image (setting it to read-only to verify disk image integrity), and analyzing the drive and its contents. Disk Imaging Definition Disk images are used to transfer a hard drive s contents for various reasons. A disk image can be used in several instances, including: restoration of a hard drive s contents during disaster recovery, for the transfer of contents of a hard drive from one computer to another, or to restore the contents of a hard drive after hardware upgrade or repair. Additionally, it can be used to create an exact replica of a hard drive or other device (CD, USB, etc.) for the purpose of analysis during the course of an investigation. A disk Image is defined as a computer file that contains the contents and structure of a data storage device such as a hard drive, CD drive, phone, tablet, RAM, or USB. The disk image consists of the actual contents of the data storage device, as well as the information necessary to replicate the structure and content layout of the device. This differs from a normal backup in that the integrity of the exact storage structure remains intact, which is pivotal in maintaining the integrity of a forensic investigation. If the file structure and its contents cannot be verified as being exactly the same as the original target drive, the integrity of the evidence is in jeopardy and could be inadmissible in a court of law. Creating a disk image file of a target is the first step of any digital forensic investigation. In any investigation, analysis is not done on the original data storage device (target), but instead on the exact copy taken. In This Tutorial An image may be taken locally or remotely. In the case that a disk image is taken locally, the data storage target is physically available, such as a USB key or hard drive on an acquired machine. In the case of remote acquisition, the target storage device is not present (i.e. a computer in a suspect s office at their place of work). There are various software that are specifically aimed towards one or the other. In this particular tutorial, we will be making an image of a local hard drive using FTK Imager. FTK Imager is a software created by the company AccessData for the purpose of creating both local and remote images. However, the free version only allows for local imaging. This software can acquire images of locally available storage devices, such as USB, hard drives, CD drives, or even individual files. In this tutorial, we will create an exact replica of a local drive (Z:\ Georges Drive) that will be used in the scope of a digital forensic investigation. 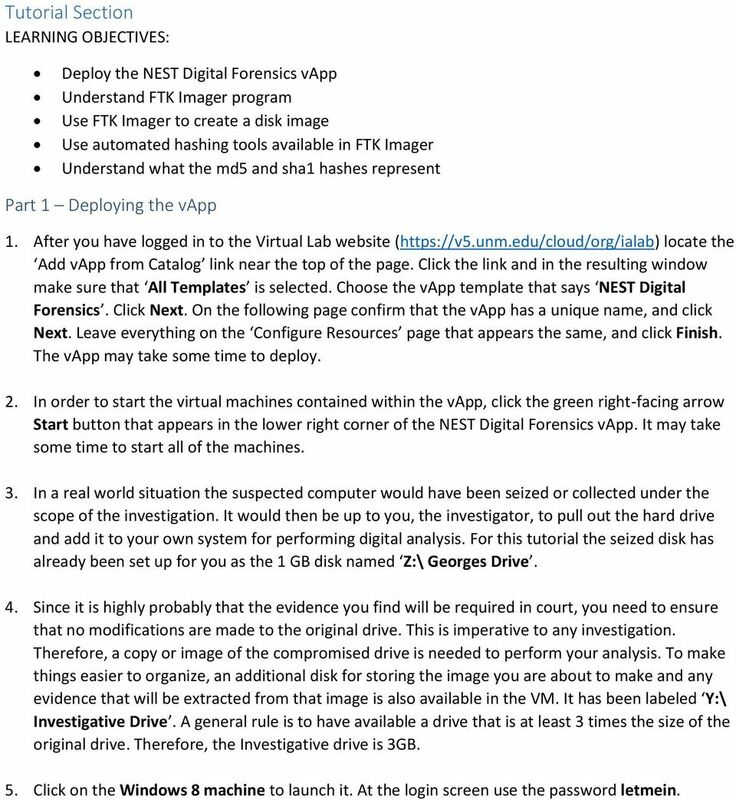 2 Tutorial Section LEARNING OBJECTIVES: Deploy the NEST Digital Forensics vapp Understand FTK Imager program Use FTK Imager to create a disk image Use automated hashing tools available in FTK Imager Understand what the md5 and sha1 hashes represent Part 1 Deploying the vapp 1. After you have logged in to the Virtual Lab website ( locate the Add vapp from Catalog link near the top of the page. Click the link and in the resulting window make sure that All Templates is selected. Choose the vapp template that says NEST Digital Forensics. Click Next. On the following page confirm that the vapp has a unique name, and click Next. Leave everything on the Configure Resources page that appears the same, and click Finish. The vapp may take some time to deploy. 2. In order to start the virtual machines contained within the vapp, click the green right-facing arrow Start button that appears in the lower right corner of the NEST Digital Forensics vapp. It may take some time to start all of the machines. 3. In a real world situation the suspected computer would have been seized or collected under the scope of the investigation. It would then be up to you, the investigator, to pull out the hard drive and add it to your own system for performing digital analysis. For this tutorial the seized disk has already been set up for you as the 1 GB disk named Z:\ Georges Drive. 4. Since it is highly probably that the evidence you find will be required in court, you need to ensure that no modifications are made to the original drive. This is imperative to any investigation. Therefore, a copy or image of the compromised drive is needed to perform your analysis. To make things easier to organize, an additional disk for storing the image you are about to make and any evidence that will be extracted from that image is also available in the VM. It has been labeled Y:\ Investigative Drive. A general rule is to have available a drive that is at least 3 times the size of the original drive. Therefore, the Investigative drive is 3GB. 5. Click on the Windows 8 machine to launch it. At the login screen use the password letmein. 3 The VM Windows 8 Desktop 6. Note the suspect s drive that we will be imaging Z:\ Georges Drive and the available investigator s drive, Y:\ Investigative Drive. 4 Part 2 Imaging the Drive 1. Launch FTK Imager by clicking on the AccessData FTK Imager icon. The following screen will appear once the program has been launched. 2. Click File and look over the various options for creating images. 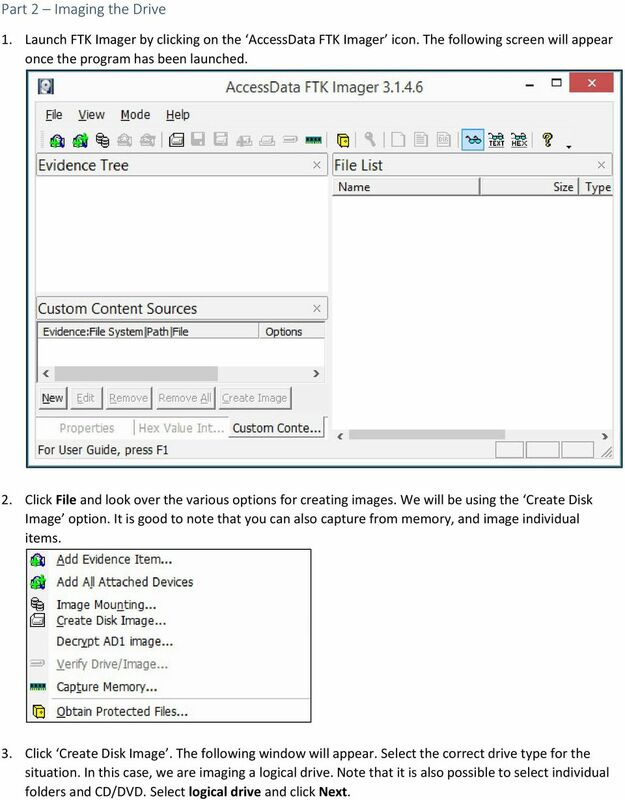 We will be using the Create Disk Image option. It is good to note that you can also capture from memory, and image individual items. 3. Click Create Disk Image. The following window will appear. 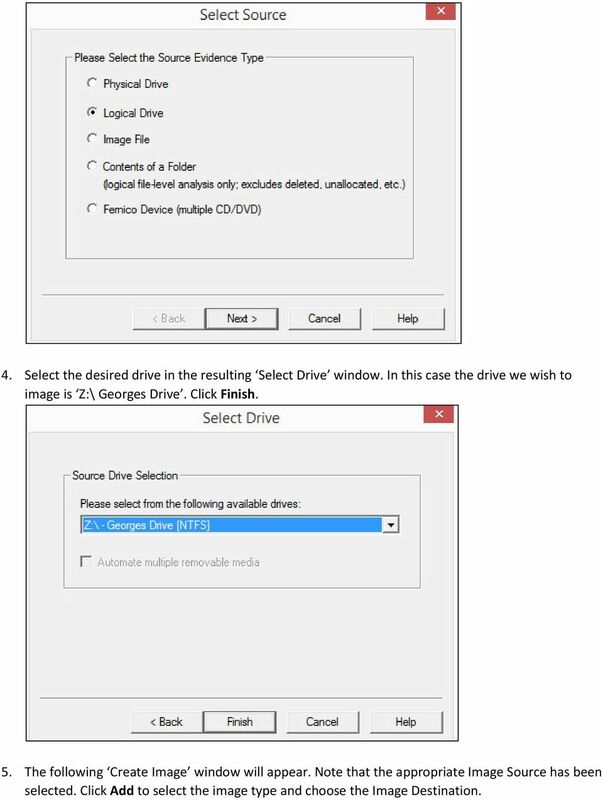 Select the correct drive type for the situation. In this case, we are imaging a logical drive. Note that it is also possible to select individual folders and CD/DVD. Select logical drive and click Next. 5 4. 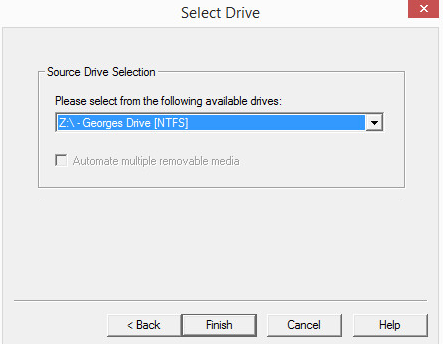 Select the desired drive in the resulting Select Drive window. 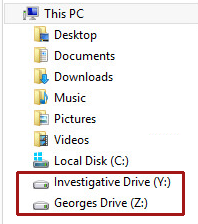 In this case the drive we wish to image is Z:\ Georges Drive. Click Finish. 5. The following Create Image window will appear. Note that the appropriate Image Source has been selected. Click Add to select the image type and choose the Image Destination. 6 6. Select the desired image format. We will be using dd. dd (disk dump) is the raw image file format. It is used not only in Windows, but also in Linux. 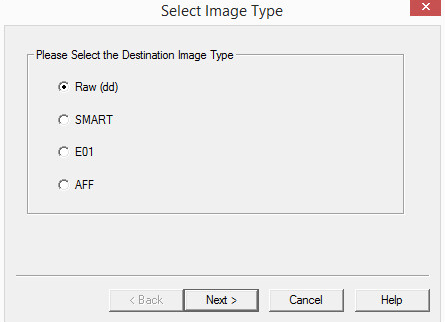 Select Raw (dd) and click Next. 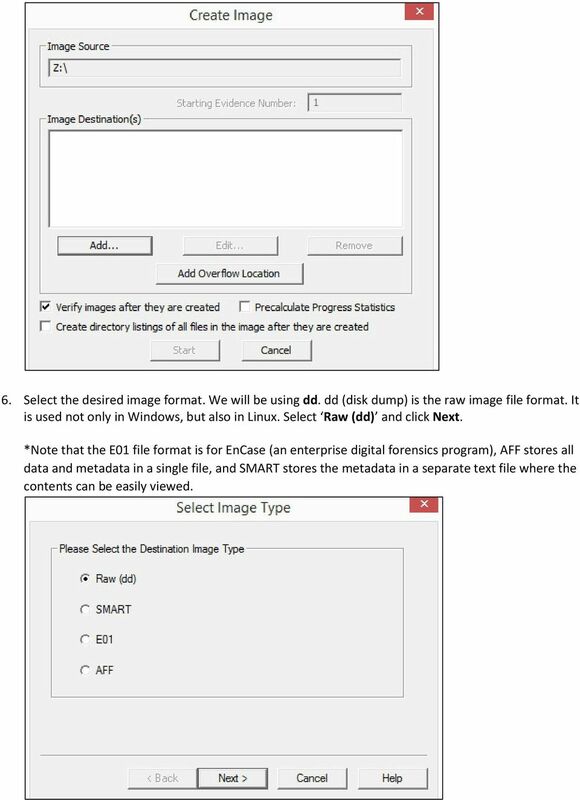 *Note that the E01 file format is for EnCase (an enterprise digital forensics program), AFF stores all data and metadata in a single file, and SMART stores the metadata in a separate text file where the contents can be easily viewed. 7 7. The following window will give you the opportunity to enter information about the case for the image. This is useful for organizational purposes. Since keeping track of everything and having detailed notes is pivotal, it is helpful to enter this information. Click Next. 8. 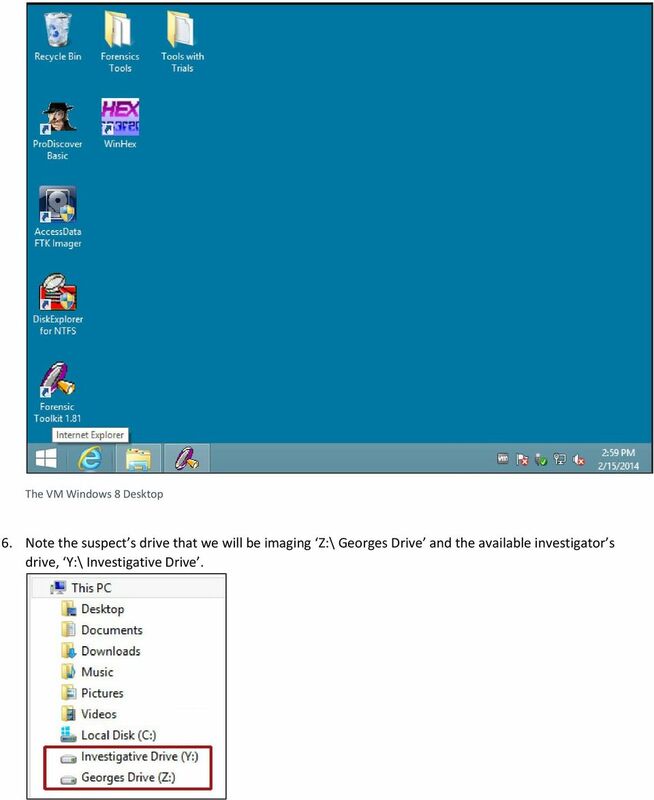 Select the folder in which the image file will be placed (Y:\ Investigative Drive). Also, give the image file a specific name if desired. 9. 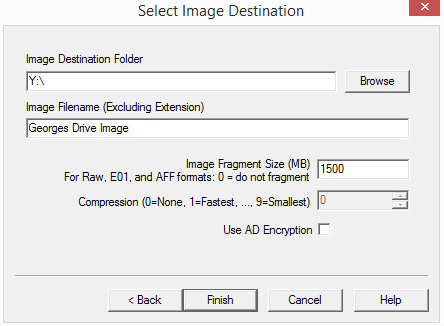 The Image Fragment Size field specifies the number of megabytes into which FTK Imager should split each chunk of the image file; this can be helpful if the image is very large or will be transported or archived on CDs or DVDs. If a value is entered in this field larger than the size of the data to be imaged, only one file will be created and it will be the size of the data. 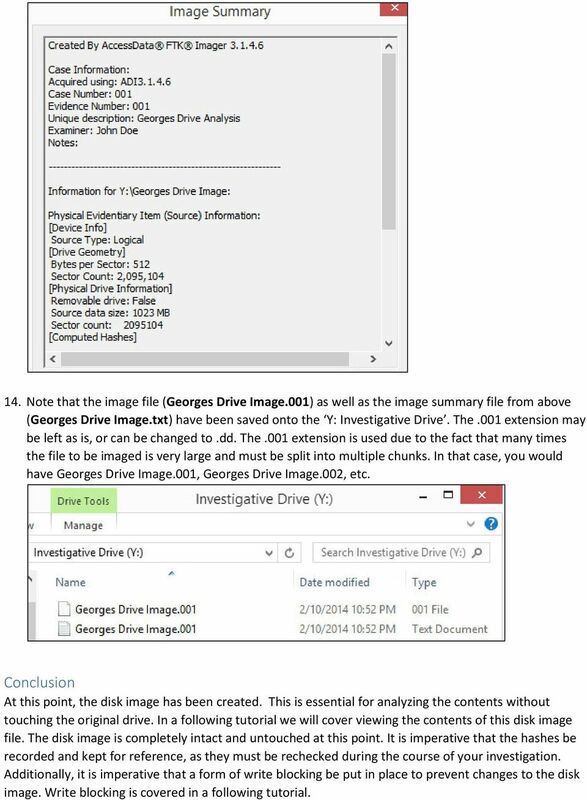 For our tutorial, if the default value of 1500 MB is left, FTK Imager will create one 1GB file since the drive we are imaging is only 1GB. The second option deals with compression; dd images cannot be compressed, but some proprietary formats, like.e01, can. Click Finish. 8 10. Note that the image destination has been changed to Y:\. The disk image will be saved to the Investigative Drive. Note also that the disk image will be created in raw/dd. Make sure that Verify images after they are created is checked this will automatically create a hash for the image. The hash is used to verify that no changes have been made to the image file. More information about hashing may be found in the hashing tutorial. Click Start to create the image file. 9 11. The image will be created. This may take some time depending on the file size. 12. The following window will appear once the image has been completed. Note that both an MD5 and SHA1 hash have been created and verified. 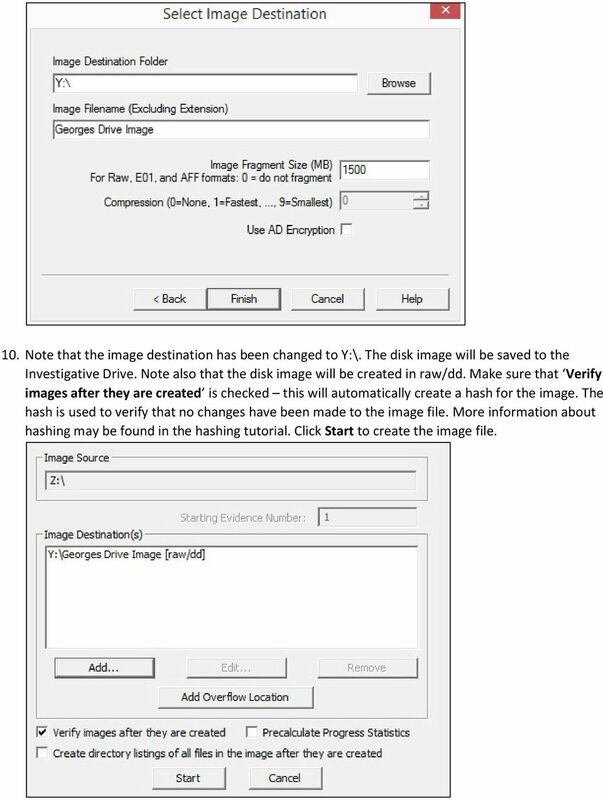 The hash is the fingerprint of the disk image if the disk image is altered, the hash values will change. 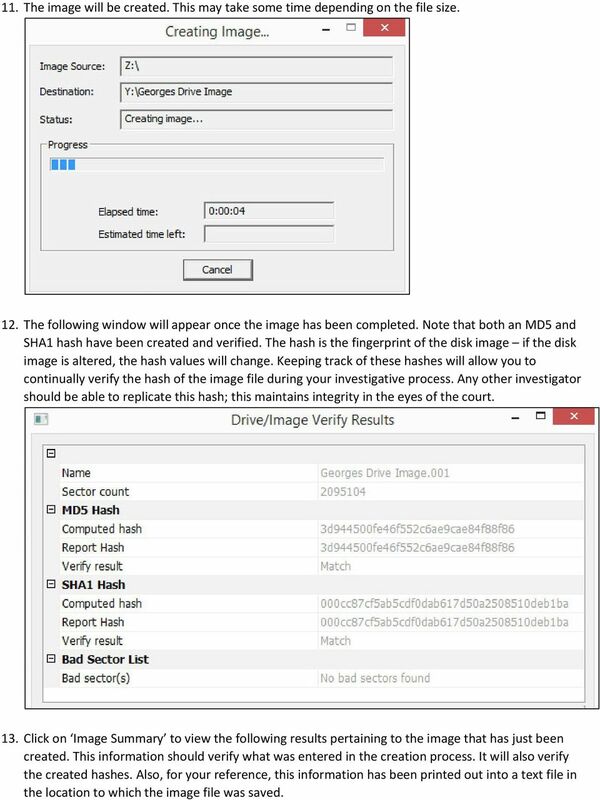 Keeping track of these hashes will allow you to continually verify the hash of the image file during your investigative process. Any other investigator should be able to replicate this hash; this maintains integrity in the eyes of the court. 13. Click on Image Summary to view the following results pertaining to the image that has just been created. This information should verify what was entered in the creation process. It will also verify the created hashes. Also, for your reference, this information has been printed out into a text file in the location to which the image file was saved. 10 14. 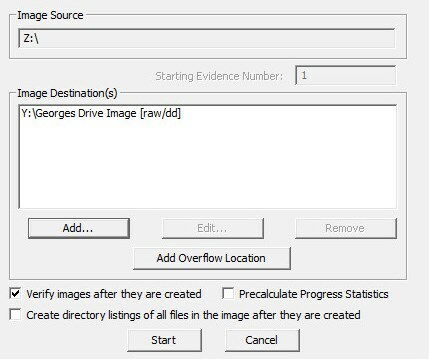 Note that the image file (Georges Drive Image.001) as well as the image summary file from above (Georges Drive Image.txt) have been saved onto the Y: Investigative Drive. The.001 extension may be left as is, or can be changed to.dd. The.001 extension is used due to the fact that many times the file to be imaged is very large and must be split into multiple chunks. In that case, you would have Georges Drive Image.001, Georges Drive Image.002, etc. Conclusion At this point, the disk image has been created. This is essential for analyzing the contents without touching the original drive. In a following tutorial we will cover viewing the contents of this disk image file. The disk image is completely intact and untouched at this point. It is imperative that the hashes be recorded and kept for reference, as they must be rechecked during the course of your investigation. Additionally, it is imperative that a form of write blocking be put in place to prevent changes to the disk image. Write blocking is covered in a following tutorial. Technology Department University of Maryland School of Law Office 8 acadtech@law.umaryland.edu 0-706-77 Introduction A computer crash, hard drive failure or a virus can wipe out everything on your computer.